Those who depend on a well for water should make an emergency well bucket for use during times when electricity is not available. The PVC pipe diameter should be small enough to pass by the plumbing and electric wires inside the well casing. If you have an emergency well bucket you will never run out of water. Operation is simple. Use a rope to lower the bucket into the well casing until the bucket initially floats, then slowly sinks as the check valve opens allowing water to fill the bucket from the bottom. When the bucket is lifted the check valve closes keeping the emergency well bucket full. Here is another homemade well bucket, with how to build instructions. The distance that water must be lifted is much less than the depth of the well. Underground streams are under pressure, lifting the water inside the well casing to within a few feet of the surface. The actual distance will vary depending upon location and possibly season. Inexpensive pitcher pumps depend on suction to lift water from awell or other reservoir. In theory, a pitcher pump with an absolutely tight seal could lift water one atmosphere of pressure, or approximately 33 feet. Since these pumps are seldom if ever manufactured using the best material or workmanship, it may be reasonable to expect a maximum lift of 16 feet. Pumps are available from Lehmans. Another option to get water without electricity is to add a manual pump into the same well casing where the submersible electric pump is located. Manual pumps are available from the Simple Pump Company . These pumps are sometimes called “sucker rod” pumps and are made from PVC pipe. The most durable of “sucker rod” pumps are made of cast iron and galvanized steel, and can pump water up from hundreds of feet. Pumps are available from Lehmans. Lehman’s solution for Water From A Well – Without Electric Power The Lehman’s well bucket may be too large in diameter to fit in some wells. One solution is to use a smaller diameter emergency well bucket described on this page. Irrigation water can be pumped using the energy of a flowing stream. No other energy source is needed. 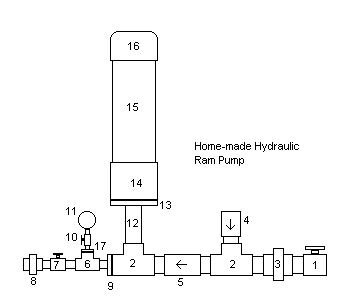 At a point in the stream at least two feet (vertical measurement) above the pump, water is diverted into a supply pipe that carries water to the ram pump located downstream. Only a small portion of the water flowing through the supply pipe is available for delivery. The greater vertical distance between input and output, the greater will be the height to where water can be pumped. 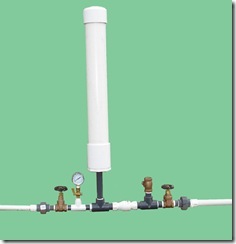 Ram pumps can be purchased or home made using PVC pipe. 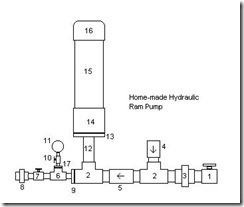 A ram pump served me very well years ago when the submersible pump failed in my well. The short term fix was to divert water supplied to garden into a 100 gallon tub next to the my back door. From there it was convenient to fill a bucket to flush the toilet.